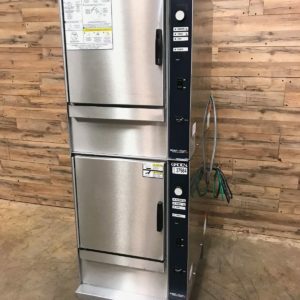 This electric Impinger I oven from Lincoln Foodservice is able to bake pizzas stacked two-high, and is efficient enough to do the work of three full-size deck ovens. The temperature can be adjusted from 300 to 600 degrees F, and the conveyor speed from 2-1/2 minutes to 20 minutes to cook your pizzas to perfection. 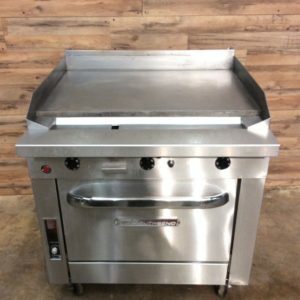 It is 78-1/2″ wide by 56-3/8″ deep (be sure to allow 29″ for door swing), and has a 32″ wide conveyor belt, a 3″ wide conveyor opening, and 40″ baking chamber. These units retail for over $17,000.00! 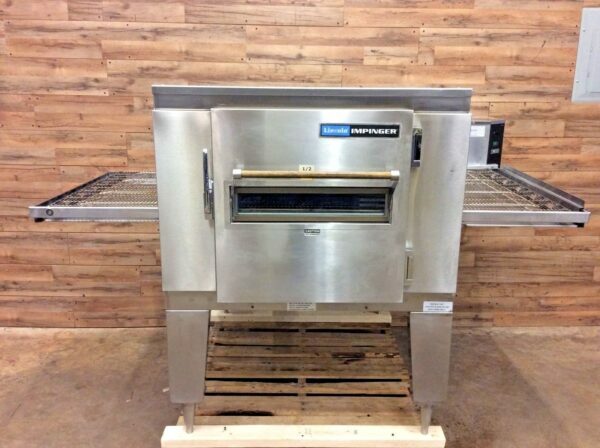 Impinger I Ovens Can Be Stacked Two High For Maximum Cooking Capacity. 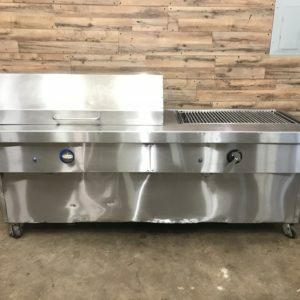 These steamers cost over $7000 each new for a total price of over $15,000 with the stand!! If you look them up on the web you will see prices in the $17,000 range!! But You can save a small fortune by buying quality pre-owned equipment from us… Your Equipment Guys! We are based in Charlotte, NC and can ship your items anywhere in the US!! Please give us a call if you have any questions and be sure to ask about all of our other equipment since we have so much more than what you see here online. Additionally, we Buy, Sell and Trade equipment. We travel all over the country to take apart restaurants and can either purchase or auction your place for you. If you have a need in that department, we hope you think of us first!! These versatile units can retail for over $15,000.00!! But you can save a small fortune by buying quality pre-owned equipment from us… Your Equipment Guys! This is. really nice unit. These an retail for over $23,300.00!! But you can save a small fortune by buying quality pre-owned equipment from us… Your Equipment Guys! We are based in Charlotte, NC and can ship your items anywhere in the US! !Please give us a call if you have any questions and be sure to ask about all of our other equipment since we have so much more than what you see here online. Additionally, we Buy, Sell and Trade equipment. We travel all over the country to take apart restaurants and can either purchase or auction your place for you. If you have a need in that department, we hope you think of us first!! In an economy where every dollar counts, finding equipment that yields the Performance and Consistency you Need, and is built with the Quality & Durability you Want, can be a challenging endeavor. …Look no further! 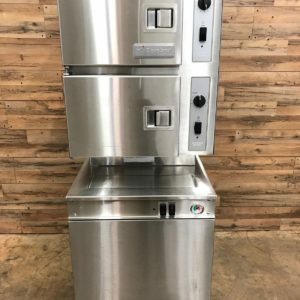 These units can retail for over $7,700.00!! But you can save a small fortune by buying quality pre-owned equipment from us… Your Equipment Guys! We are based in Charlotte, NC and can ship your items anywhere in the US! !Please give us a call if you have any questions and be sure to ask about all of our other equipment since we have so much more than what you see here online. Additionally, we Buy, Sell and Trade equipment. We travel all over the country to take apart restaurants and can either purchase or auction your place for you. If you have a need in that department, we hope you think of us first!! 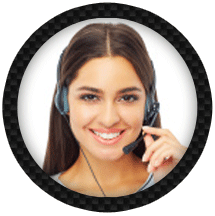 Whether you are looking to buy, sell, trade or Auction equipment, we will work with you every step of the way. We understand you’ve got a business to run. If you are looking to sell some equipment so you can upgrade, or even looking to liquidate and want to sell it all. We will come to your location, assess your equipment and give you a fair price offer. Many times we can even do this through pictures via email. We are capable of buying one item or an entire restaurant. 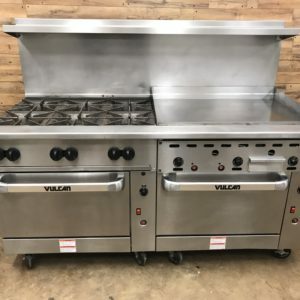 We have the necessary tools and experience to remove everything, including hoods, fire suppression, rooftop exhaust motors as well as walk-in coolers and freezers. 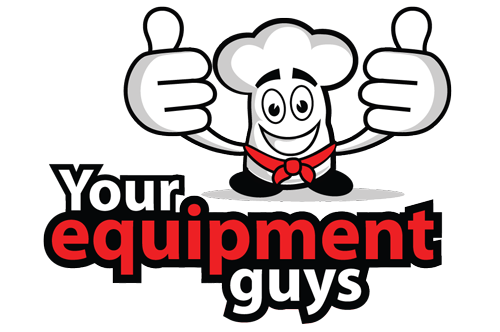 We want to be the first call you make when it comes to your restaurant equipment needs. The way we accomplish that is by giving the best service we know how, selling only quality equipment, providing a straightforward buying experience and reducing the amount of difficulty and stress involved in buying and selling your equipment. We go out of our way to please our customers! We value not only your business, but your time as well!